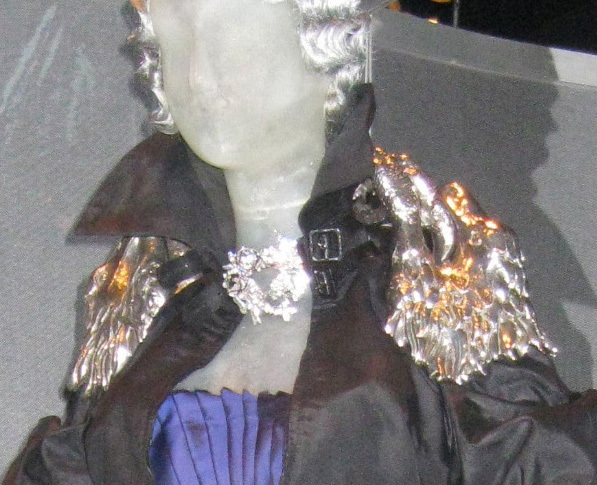 For this week’s Daphne Wednesday I’m featuring the stupendous navy blue dress by Christian Lacroix and black silk taffeta jacket with silver eagle epaulets by Alexander McQueen, from the “Dandyism” section of the exhibit Daphne Guinness, now on view at The Museum at FIT. I hope when the exhibit’s catalog comes out later this month there will be more details about the pieces on display. I am especially curious to know what metal the epaulets are made of and how much each one weighs. The blue of this Lacroix dress is gorgeous. 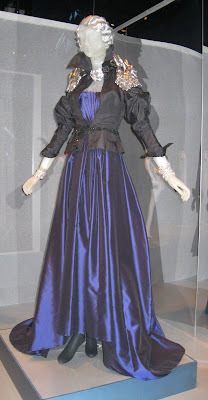 In the photo below, notice the pleating in the bodice. The eagle epaulets in closeup. You can make out the eagle’s head on the right, with the eyes and beak facing the mannequin’s hair. Amazing! More of Alexander McQueen’s artistry at work. I am in great need of eagle epaulets right now, wowwwwwwwwwwwwww. I adore Lacroix. Pity he had to stop the dream. Thank you my dear Jill for your kind words and for being there for me. Nothing else to say, but...GORGEOUS!! the epalets almost look like gold embroydery thread...gorgeous and how much work! That must be fantastic to see up close. Wow! That is an amazing outfit and that jacket is a work of art. What a wardrobe. Thanks for the tip off about the Louboutin exhibition - hadn't even heard of it fancy that! Hopefully I can to it. Hi Sacramento, I am so with you, I need some eagle epaulets right about now! I should be thanking YOU for being there for ME! Hi Pam, I'm so hoping you will go to the Jean-Paul Gaultier exhibit heading to Dallas and opening in November. 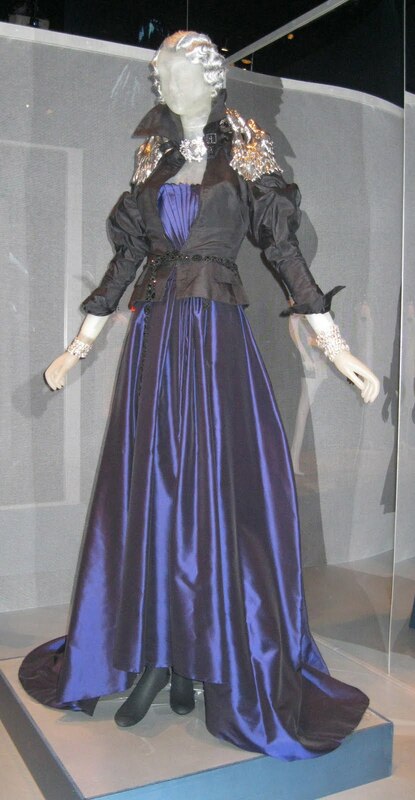 Hi Paula, I can't wait for the exhibit catalog to come out, not only to learn more about Daphne (I hope), but to see some of the pieces, like this dress and jacket, in detail. Hi Bella, mostly good busy here but I do not know where October is going, just like I can't believe September has already come and gone! Hi Veshoevius, I don't remember know where I read that Louboutin will have an exhibit in London next spring but I think you should ask for a press pass and go, take pictures, and post them on your site! I would love to see that show.